FANCY A CHALLENGE for 2019? Do you like the idea of running and raising money for PTSD Resolution? PTSD Resolution is a charity helping veterans, territorial army and reservists who are struggling to settle back into a normal work and family life because of military trauma suffered during service in the armed forces. So why not set yourself a 2019 challenge and run for us, while raising money for a worthwhile cause. A PTSD Resolution t-shirt or running vest will be provided for all runners and a wrist band for each participant. The biggest half marathon in the UK and the World with over 57,000 runners taking part in the famous 13.1 mile run, where participants run between Newcastle upon Tyne and South Shields. The race was devised by former Olympic 10,000 metre bronze medallist and BBC Sport commentator Brendan Foster. Although a high profile event for elite runners, four-time Olympic gold medallist Mo Farah won the Great North Run 2016 and became the first man to achieve three consecutive wins, it is for all abilities and ages with many using the run to raise money for charity and take part in fancy dress. All finishers will receive a finisher's pack containing a medal, t-shirt, a drink, and a space blanket. It was founded by former international athlete Tim Hutchings and by former Brighton club athlete, Tom Naylor. The event is organised by the Grounded Events Company ltd. The first running of the race took place on 18th April 2010. 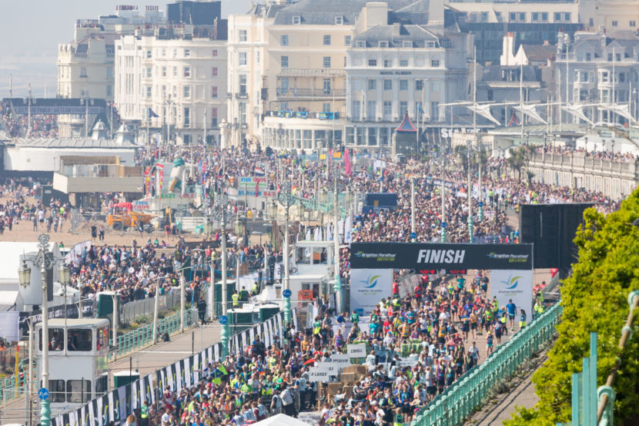 Since it’s inauguration, the Brighton Marathon has dramatically developed to become the Brighton Marathon Weekend. The course bests for the men and women are well under 2hrs10min and 2:29, making it the second fastest marathon in the UK. It is also the second largest marathon in the UK and twelfth largest in Europe. 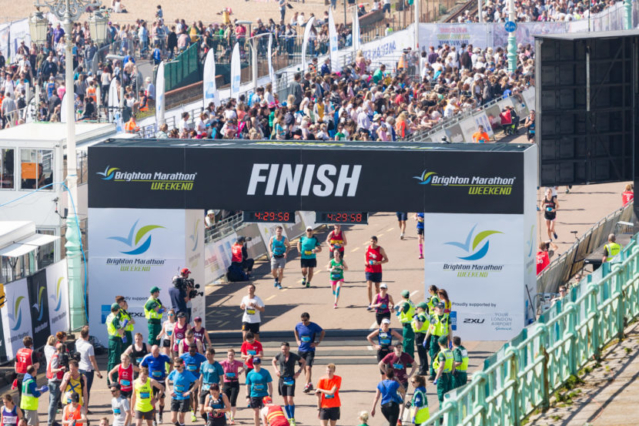 The Brighton Marathon Weekend kicks off at the Event Village on the beach, which is located next to the Finish Line at Madeira Drive. The main event takes place on Sunday 14th April at 9.45am in Preston Park. The Event Village will become a hive of activity and celebration as runners reunite with friends and family and enjoy the live footage, eating, drinking and fantastic atmosphere. Spectators can also make use of the Grandstand seating at the Finish to cheer the participants home. official kit bag with their Race Pack. once you have crossed the finish line. These tickets are an addition for this year, so we’re hoping lots of people will take the opportunity to run this great marathon. You can Experience the south coast’s best 10 mile event and celebrate everything that’s great about Portsmouth. If you're looking for a personal best, this flat and fast course is the perfect choice for your greatest victory. With the added bonus of closed roads and stunning sea views! Around 20,000 runners take on the 10-mile course each year, which takes you through the streets of Portsmouth passing the sights of HMS Victory, HMS Warrior and the Mary Rose Museum. All finishers will receive a finisher's pack containing a medal, t-shirt and other goodies. This Marathon is also an addition this year. It is known for its buzzing atmosphere, incredible supporters and the booming anthems that rock the city's streets, experience a running event like no other. And remember, no matter how you get to the start-line and whatever your reason for running, do something to show them what you're made of. Registration is easy – we manage it all for you., there is no entry fee. Just email komeara@ptsdresolution.org. I will register you and send you a link, all we ask is that you raise the following minimum amount for each race below. If for some reason you can’t run, do let us know and we can pass on the token to someone else or you can defer it until the following year. What if I want to run in a different event? That’s fine too. If you want to take on a different event/challenge, simply contact us with full details, the nature of the event (distance, location) date and web link at komeara@ptsdresolution.org and we can send you all you need to fundraise. We can promote your event or marathon on our Facebook page and Instagram, so please do send us lots of photos in training and the event itself. Please set up a free charity page on our Just Giving site – visit the page and click on "Fundraise for Us"
Just Giving - https://www.justgiving.com/ptsdresolution/ - funds go directly into the charity's account. There are many different Marathons throughout the country why not click on the link below and see if there is one near you!